A splitting maul is a useful tool for own if you work with cutting firewood for personal use or to sell. 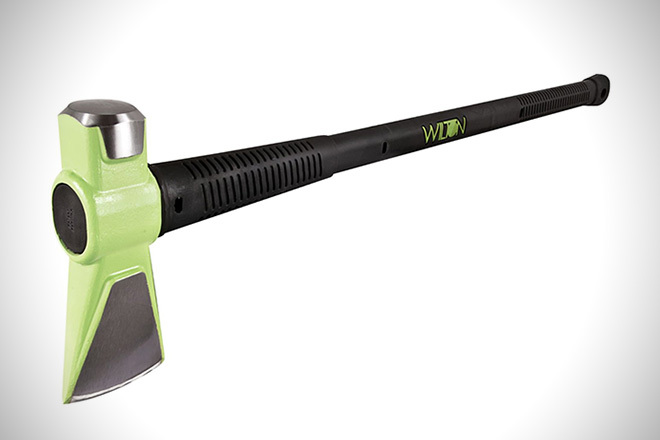 The maul allows you to split large chunks of wood easier than using an ax alone. A splitting maul can also help you waste less wood over time. If you are interested in buying one of these resourceful tools, it’s important to learn more about how to use a maul. By learning as much as you can about the product, you should be able to determine which is the best splitting maul to invest in. The first thing to do when searching for the right splitting maul to use, is to learn more about the tool itself. A splitting maul is a large and durable tool that is used to split chunks of wood into smaller pieces. This makes it easier to load the wood for hauling or to carry it from one location to another. Although you can get the job done using an ax, a splitting maul makes the task much easier to complete. Ask anyone who has chopped firewood before and they will tell you anything that can make splitting firewood easier, is a tool worth having. A splitting maul is also resourceful because it causes practically no part of the wood to go to waste. That means you endure less splitting as you enjoy more firewood for your home over a longer period. How Will You Use Your Splitting Maul? Should You Buy a Lightweight or Heavy Maul? Do You Need a Splitting Maul with a Blunt End? Since there are so many different types of splitting mauls available, there are some things that you should consider before buying one. The first thing that you should ask yourself before you purchase a new splitting maul is if you want to use the tool for chopping wood or splitting wood. If you want to use the maul for chopping wood, you should look for a smaller maul that has a lighter head and shorter handle. It should also have a sharp blade. You don’t need to buy an extremely heavy maul for chopping wood as it won’t make your job any easier. However, if you plan to use the tool for splitting large or tough blocks of wood, you will want to buy a heavier maul that has at least an 8lb. head and a handle that is at least 36”. For best results when dealing with larger pieces of wood, buy a splitting maul that is extra sturdy. This will provide you with the maximum amount of power with every swing. There are some mauls that feature a blunt end on the head. This can be useful if you need to drive stakes or fence posts into the ground. If you feel that you will need this feature for other tasks, it would be worth buying a maul that can serve more than one purpose. However, if you don’t have a need for a tool to help drive stakes or posts, a splitting maul without a blunt end will work for you. Because the overall weight of your splitting maul is proportional to the power of the swinging impact, it is worth thinking about the amount of power you will need to split the wood based on its density and toughness. Therefore, you will need to buy a splitting maul that is the right weight to handle your specific wood splitting tasks. One rule to remember is the tougher the wood is, the longer your splitting maul handle needs to be. A longer handle can produce a powerful impact for each swing. That makes it faster and easier to split a load of wood, regardless of how heavy the wood may be. It can also help to prevent severe muscle fatigue. There are also benefits to having a shorter maul handle. When you have a shorter handle, the maul is much easier to control. A maul with a handle that is under 36” is often recommended to users who are new to working with this type of tool. Because the shorter handle is easier to control, it is also much safer to use. But, you won’t want to attempt to use a short-handle maul on tough, hard, or large blocks of wood. While it may be effective, the job will take much longer and be more exhausting. You should also think about the material the handle is made from. The construction of the handle will help determine the overall strength of the tool and how long it will last. The best splitting mauls have handles that feature either a plastic or rubber grip. This helps to prevent blisters from occurring. It also keeps the handle from slipping out of your hands. This is an important safety feature that you should look for, especially if you plan to use the maul often or if you are a beginner. Maul handles can be made from various materials such as wood, fiberglass, or a combination of wood and metal. Mauls that have wooden handles are often more affordable and help to make the overall weight of the maul lighter. This is a good option for use with firewood or soft wood species. If you prefer a splitting maul that is heavy-duty, you should invest in one that has either a metal or fiberglass handle. Another good type of handle that can be used for tougher jobs is one that is made of wood and reinforced with metal rods. A splitting maul is a very heavy tool, and that is something you should be aware of before you decide to use one. Most mauls feature an 8lb. maul head, however, there are some that are lighter and may be used to split smaller chunks of wood. Mauls are heavier than most axes, and they will usually have a much longer handle than your common ax. Your standard splitting maul will have a handle that is 36”, yet there are also some that have a shorter length. When purchasing a maul, be sure that the handle is long enough so that it hits the ground following a strike, instead of hitting your foot. While using a splitting maul can make your job much easier than using an ax, you shouldn’t use a maul to do the same job as an ax, or an ax to do the same as a splitting maul. These tools should be used together to make the task simpler. Using them in any way to chop or split firewood aside from how they are intended to be used could be dangerous and may result in a serious accident. That is another reason why choosing the best splitting maul, as in one that is considered a high-quality product, is important. Buying a splitting maul can be overwhelming since there are various sizes available. 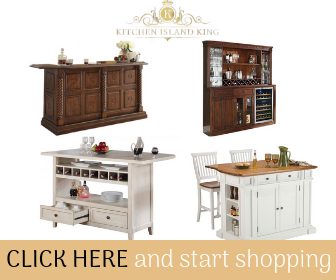 There are also several different brands to consider sold at your local home improvement store or online retailer. Regardless of your experience using this type of tool, you can find the best splitting maul by checking out the helpful reviews listed below. This 8lb. 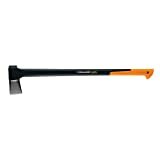 Fiskars maul has a double-sided head and is perfect for splitting wood or driving stakes. It has multiple features that make it a great buy for those who want something that can do more than simply split wood. The highly engineered blade allows you to swing harder for difficult jobs. And the blade has a rust-resistant coating, so it can be left outdoors without worry. It features a high-performance handle with texturing to reduce discomfort and slipping. This product comes with a lifetime warranty. This rugged, powerful maul allows you take on intense wood splitting jobs while helping to reduce muscle fatigue and joint pain. Premium steel is forged into a concave shape that’s optimal for splitting, helping to make every swing your best. The Husqvarna 32” Wooden Splitting Maul is one of the best products you can buy for splitting all types of firewood. Husqvarna is a high-quality lawn equipment brand that has been an industry leader for decades. This product can be used either as a sledge, an ax, or along with a splitting wedge. It features a solid hickory wood handle and a secure head that can withstand years of use with hard wood. It includes adjustable compression pockets and a chest strap. The Performance Tool M7111 8lb. Splitting Maul has a strong fiberglass handle to help you work through even the toughest chunks of wood. The handle features anti-shock cushion grips made from rubber for ease of use. The tapered blade is well-honed and cuts extremely well considering this is one of the more affordable mauls on the list. The downside of this maul is that some reviewers have mentioned that their tool has broken at the joint located between the head and the handle. However, this is after long periods of use. The Wilton Tools 50836 8lb. Head B.A.S.H. Splitting Maul has a dual side splitting and driving head, and one of the strongest handles in the industry. Some have claimed that the handle is virtually unbreakable. It is made from reinforced steel rods and covered in an anti-slip, comfortable rubber coating. Additional features include the anti-vibration neck and the drop-forged, extremely durable head. The only complaint found about this top-rated splitting maul is the weight, as some have mentioned that it may be too heavy for the average user. It is also one of the more expensive mauls on the list, but with the quality of the handle, it is still a great investment for anyone who splits wood often. The True Temper Sledge Eye Wood Super Splitting Maul has received many positive reviews for its durability and power. It may be a lightweight tool, however that allows it to be more manageable than others in the industry. 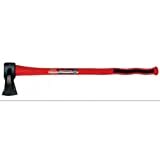 This maul features a molded handle guard, and a long 36” handle made from strong fiberglass material. There are some reviews where customers mentioned that their handle has cracked during heavy use. If you are interested in buying a splitting maul that is more durable, you may want to choose another option. This maul comes with a limited lifetime warranty. The smaller Estwing Double Bit Axe is perfect for casual users who only need a maul to split soft wood or firewood on occasion. Weighing only 38oz., it is a good beginner maul to use because it is much easier to manage than larger tools. One of the best features on this splitting maul is the forged steel construction that prevents it from breaking at the seam. It also includes a shock-absorbing grip. The Estwing Double Bit Axe comes with a strong and durable ballistic nylon sheath for storage and protection. The Truper 32415 Splitting Maul weighs an impressive 12lbs. which allows it to be used often to split hard and tough blocks of wood with ease. This is one of the best heavy mauls that you can buy, and it is designed for experienced users. The bright red maul has a rubber handle guard that protects against overstrikes. There is a blunt side on the head that may be used for driving stakes or wedges into the ground. There is a large market for splitting mauls, so there is no lack of a good selection to worry about. 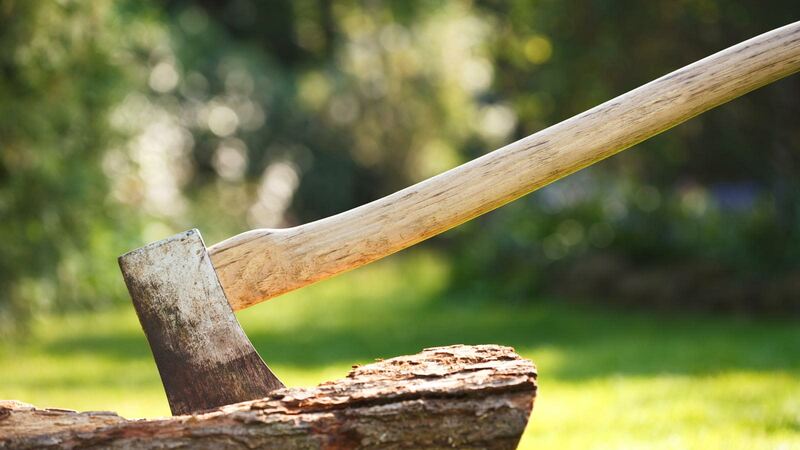 Whether you use a maul for your job, or to help with splitting wood for personal use, these tools can help cut your wood-chopping job in half. The products mentioned here are some of the very best splitting maul tools in the industry. You are sure to find one mentioned here that will help you complete your task easier.